Our friends and family can be obstacles to our freedom when they have the crabs-in-a-bucket mentality. The most important choice we make in life is whether we live our authentic life or the life that others want us to live. Deep inside, we are all most joyful when we are living our authentic life. We want to feel free and fulfill our dreams. This drive to live OUR life is connected to our life force. When people feel that they cannot live their authentic life, they often lose their will to live. We want our friends and family to be our biggest supporters. Likewise, we want to support them in being themselves. Since we all want it, why don’t we have it? People’s beliefs cause them to become obstacles to our freedom. Beliefs separate us into groups of like minds. We can tolerate or ignore a stranger who is unsupportive because of their beliefs; but when those we love the most can’t support our life choices, the pain is almost unbearable. Sadly, we often learn just how conditional another’s love was once we no longer agree with them. A young man tells his Christian parents that he is gay, and suddenly their perfect relationship is damaged. A young boy chooses to major in art instead of engineering; and his parent’s belief that he will never get a job arises. Now he must battle their belief to fulfill his dream. A woman has been a member of a church for years, but now she questions her beliefs and her friends abandon her. In each case, the mere expression or change of beliefs makes it painfully obvious that a valued relationship was conditional. The person who can’t support our heart’s desires thinks that their beliefs are the truth. They’ve seen evidence that proves them right in their mind. They are sure that we are wrecking our life with our decision because it flies in the face of their beliefs. They can’t support us; so they become an obstacle to our freedom. Real support for others starts when we follow our own heart. If we don’t value our own inner wisdom, if we’ve given up our dreams for others, if we hide our talents and gifts, then we accept such behavior as normal. We think everyone should follow our example. We may even think that the purpose of life is to suffer. We hide our gifts and think someone who expresses theirs is arrogant or boastful. Clearly, you can’t support another if you judge them as arrogant. But I challenge that thinking because if God gives us a gift, it is arrogant to hide it and not express it. It is like we are saying, “I know better than God.” And the truth is that our false self or ego does think that it knows better than God. The True Self doesn’t think, it feels. In today’s self-help obsessed world, there are many people who say to ignore our emotions; follow only reason and logic. Think…visualize…intend…affirm. Don’t let your mind think a negative thought. Some people even say that all problems are caused by people following their emotions. And they are right if you want to succeed in the false world. They are teaching male-brain dominant techniques which work in the dual illusion since it was created by men to be patriarchal. Logic is the key to the false kingdom. I was blessed with strong logic, and I could succeed in that world. But that success was worthless to me. It just didn’t make my heart sing; I didn’t feel authentically me. Feelings of the spirit are not the same as emotions. Emotions are caused when we think something false, something that is sending us down the wrong path. But that doesn’t mean we should ignore them; we should listen to them and let go of the belief that is causing them. Feelings, on the other hand, are calm. When we follow our feelings, we are relaxed and peaceful. It is a rare person that escapes this experience completely. Few life experiences leave bigger scars. When we ignore our dreams, it is painful to see another follow their dreams. You may have heard this famous, little story. It describes a common human behavior that is behind all of the obstacles to our freedom. 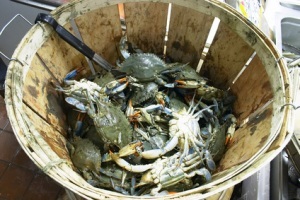 Some call it the crabs-in-the-bucket mentality. There was a man who went crab hunting. At one of the first rockpools he found, he saw a lone crab. He placed it into his bucket and started walking home. About halfway home, he noticed that the bucket was empty. The crab had climbed his way to freedom. A short while later he came across six crabs in a larger pool. He caught the crabs and raced home before they could jump out. On arriving home, he was astonished. All six crabs were still in the bucket. “Strange,” he thought. “Surely one of them should have escaped. Perhaps they are happier when surrounded with other crabs.” So, he watched the bucket for a short time, and saw something astonishing. The crabs were trying to escape, but everytime one of them started climbing the side of the bucket, the other crabs clawed them back, thus preventing any of them from escaping. I never experienced this phenomenon until adulthood. After I married, I noticed that my new family had this crab mentality. Because their beliefs restricted the quality of their life, they resented my successes. They hated that I was so damn happy all the time. They became painfully aware of their unfulfilled dreams when they were around me. And they saw me as the cause of that pain. After all, they weren’t bothered by their unfulfilled dreams until I proved that dreams could be fulfilled. This is how life works. We often don’t feel emotional pain regarding our beliefs until we experience the effects of them. We feel the effects of our beliefs when we raise our standards or go for a larger goal than we have in the past. As long our beliefs are not tested, we think we are perfectly happy in our little crab pot. But when someone else gets what we secretly want, our desires come alive. When our desires come alive, the beliefs, and related emotions, that held the desires away bubble up from our unconscious body-mind. We think the successful person caused our jealousy or envy because we suddenly feel it in their presence. We look outside and blame them, instead of looking inside and blaming our beliefs. My family’s emotions surfaced in my presence, but I wasn’t the cause of those emotions. Their beliefs were the cause; they got their beliefs from their parents, their culture, and their priest. They would say I was lucky in a condescending tone; they believed that luck came from selling your soul to the devil. They thought I submitted to temptation. They would say I was arrogant for flaunting my success when I was just sharing my life. It was clear that they desperately wanted me to be small like them. But why? Many people who keep themselves small hang around other small people; that way they don’t have to feel the pain of their unfulfilled dreams. They love to watch the news or read the newspaper because they say it reminds them that others have it worse than they do. Over time, I started to feel that I was hurting this family that I chose. I felt the need to conform to keep peace. I avoided discussing my successes and emphasized my failures and problems. I dressed down in their presence and tried to keep myself small so as not to offend them. But I also started to resent them. I didn’t want to be around them anymore. They became my prison walls; and all I could think about was freedom. Beliefs tell us that they give us what we’d actually get by letting them go. Beliefs are very strange creatures. They appear to unite and create agreement. They appear to be moving us toward happiness, riches, and health. Although we feel united with our fellow believers, we find separation and disagreement with everyone who doesn’t belong to our club. A group of friends will unite over a common enemy causing all of them to lose. These are some of the obstacles to our freedom. In my new family, I was the common enemy; and I knew it. I allowed their beliefs to affect me costing me my own life force. Without life force, we can’t create; our goals and dreams seem impossible. I could not get them to understand my point of view and so I felt that I had no choice but to accept their perspective. You see they lived their whole life in a community where everyone shared the same beliefs. From their perspective, their beliefs were not only right; they were the truth. They saw evidence of those beliefs nearly everyday. The beliefs were supported by rules that kept everyone in order. If you disobeyed the rules, you deserved punishment. But I didn’t share their upbringing or their community. I came in with a different point of view, a view which had no beliefs or rules. We didn’t see anything the same way because they couldn’t let go and see my world, and I could not twist my mind to see their world. What stymied me for a long time was that they could not see that their beliefs were not working. Likewise, they couldn’t see that my lack of beliefs was working. They wondered why they never got what they wanted, and they endlessly complained about it. They were sure that their beliefs would bring them rewards soon. But this is the nature of beliefs. They tell you that they are giving you what you want when they are actually keeping what you want away. People rarely drop their beliefs. They usually just move to the opposing polarity. When someone looks through their veil of beliefs, they are peering into a dual world. They see everything as having an opposite. If someone doesn’t agree with them, they view the person as an opponent. This experience taught me why our world is so stuck; and what we need to do to get out of the crab pot. Ideally, we would all prefer unity consciousness. But people who are firmly grounded in the illusion don’t remember that unity consciousness exists. Our true Selves don’t like division and separation. Beliefs always have two sides. If we unify the two opposing poles, the belief disappears; and we are left standing in the truth. When we are in truth, we are focused on our Self. To someone in the illusion, we appear selfish. Our Self knows where we are headed; and it only chooses a direction that is win-win for everyone involved. Our true Self leaves the details to the forces that are grander than us. When we live from the truth, we don’t have to micromanage our life. If I discussed money with my family, I saw abundance. I honored the places in my life that were abundant and saw non-abundant circumstances as errors to be corrected in my mind. But they heard my abundance as a rich person taking from the poor. They saw me as bad; and were trying desperately to make me good. On just about every topic, we had mismatched perspectives. We were living in two different worlds. 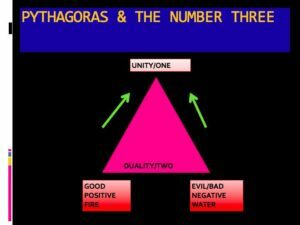 Pythagoras said that all problems can be solved if you know two sides of a triangle. His mathematical theory was a perfect metaphor for solving life’s problems. When our mind is filled with beliefs, and we are standing in duality, we create the battle of good and evil, which lives at the bottom of the triangle. We meet our rejected shadow over and over again. We can’t hold one side of a coin, nor can we hold one side of duality. But we can project the side we don’t want outside of us and see it in an enemy. Back to abundance. Because my family saw the world as rich and poor, they identified with one side of that pair of opposites. They chose to identify with poor so that they could be holy. Then they projected rich out into the world. And they hated the rich because they were not holy. I looked like a rich person to them, so I was bad, unholy. But you see, my status in their lives was not true; it was their opinion caused wholly by their beliefs. After I learned how to let go of their point of view in my mind, I could peer into their world. I could now see that there are two worlds existing simultaneously. There is the world of unity and truth. That world has no opposite. Words like freedom, peace, joy, and abundance describe this world. This world is real and true. It was created by our true Self, or our God Self. It can’t be created nor destroyed. It can only be enjoyed. Then there is the world of duality. This world is real, but false. All beliefs are in the world of duality. This is the world of good and evil, pretty and ugly, happy and sad, and rich and poor. The key to letting go of this world is to realize that it is completely false, created only by beliefs. It is an illusion. When we create a life that supports our beliefs, we fear leaving it because we won’t fit in. I lost my way in life for a long time because I felt that I needed to make my husband’s family comfortable. Holding myself small started to make me small. My mind eventually thought like them. We came to share the same obstacles to our freedom. But they had so much apathy and lack of desire that they accepted those obstacles as normal. I, on the other hand, wanted to die. I saw the urge come up within my mind to bring others down with me, but I resisted that urge because I knew how it felt when they did it to me. I realized that I was living as an adult what most people live as children. I was lucky to have made it so long without losing my Self. I hated living in the false world of my family, but I had compassion for them. They couldn’t fix their error because they couldn’t see it. Everywhere in their life were enablers that kept their illusory point of view alive. Their friends, their family, their church, their social organizations all supported their illusion. I held the key to their freedom; but the fear of unknown freedom is often far greater than the prison cell you know. They feared becoming me — someone who didn’t fit in. I forced myself to see both sides of every issue; and to recognize that neither side was true. As I let go, the confusion arose in my mind that I originally felt coming from them. I had to face the fear that once I let these beliefs go, I would no longer be acceptable. But you see not fitting in and thinking you might be bad or evil is completely different than not fitting in and knowing who you are. Once you know who you are, they can’t pull you back into the bucket. They can’t affect your mood. And you no longer feel guilt or shame if their emotions arise and cause them to be jealous. You become a true leader. Sometimes, a crab or two might even follow you to freedom. I realized that their need for me to give up my dream was win-lose or even lose-lose. Following my heart did not harm them. The impact I had on them was that their own heart started to make some noise and say, “Hey why don’t you jump out of the pot too.” I gave them a choice that they never had before; and that was win-win. I realized that there is no evil in the world. They saw me as evil because I challenged their beliefs. And their beliefs were false. Their beliefs were keeping them from living their life. I wasn’t giving them evil; I was showing them how to live. Ironically, evil is live backwards. I found the keys to the kingdom. When we have a win-lose belief, we are the ones that need to change regardless of how uncomfortable it might be. Our children and family, who are different, are exactly the gift we need in order to see and then let go of our beliefs. We don’t have a right to ask others to conform to our beliefs. If we want to suffer in the crab pot, we need to have the decency to allow others to escape if they want to. In the native world, the lead crab, who escapes from the pot, was often called the coyote or the raven. They were a trickster and they made things uncomfortable to force people to expand their point of view. The shaman taught that without a trickster a culture or family would die; they would lose their purpose. A trickster often looks like a traitor or adversary; but when we embrace them and let go of our beliefs, they become our savior. They bring us closer to our authentic self giving us exactly what we truly want. It has been over 30 years, and my old family is still in the pot. I jumped out. Eventually, no matter how hard they tugged on my legs, they couldn’t hold me back. I was FREE. Once again your article is right on point. No BS. Wisdom and finding my real self is my true goal. I will continue to let go of my BS.